All good sentences have to come to an end, often with a full stop. 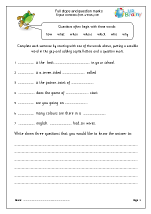 The new English Programme of Study states that capital letters and full stops to demarcate sentences should be introduced in Year 1, as well as capital letters for names. 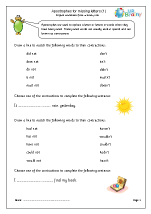 The good news is that we have just published our first set of punctuation worksheets. 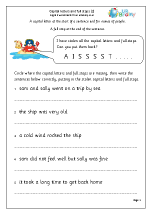 Beginning with recognising capital letters we quickly move on to writing sentences with a capital letter at the beginning and full stop at the end. 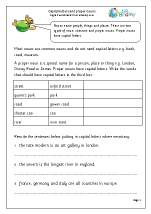 Using capital letters for proper nouns is trickier and will also need to be covered with older children. 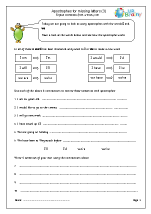 There is a great choice of worksheets on this subject including finding the missing punctuation to writing names of football teams correctly, with examples such as Brighton and Hove Albion, where the ‘a’ in ‘and’ does not have a capital. It can get even more complex; for example, French stick is meant to have a capital ‘f’, but not french windows. However we will leave these idiosyncrasies for another time! Whilst there is a definite rule for when to use a question mark, it is more a matter of choice when to use an exclamation mark. To begin with we limit use to commands and expressions of surprise or emotion. Later other uses can be introduced, such as indicating irony or scorn. 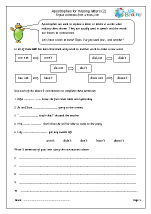 Exclamation marks are a great favourite for children once they understand how they can be used, however, they need to be aware of overusing them. They are frowned upon in the world of journalism. The comma is a nifty little piece of punctuation with many subtle uses. 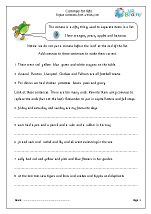 To begin with, however, children are expected to know and use them to separate items in a list. 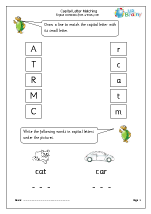 Question marks and exclamation marks are meant to be introduced in Year 1 and using the comma for lists introduced in Year 2.